God of infinite goodness who loves the innocent and exalts the humble grant that, in imitation of Blessed Francisco and Jacinta, we may serve you with purity of heart and so be worthy to enter the kingdom of heaven. Through Our Lord Jesus Christ, your Son, who lives and reigns with you and the Holy Spirit, one God, for ever and ever. Franciso and Jacinta Marto were officially declared saints of the Catholic Church by Pope Francis on May 13, 2017, in Fatima, Portugal. The brother and sister who tended to their families’ sheep with their cousin Lucia Santo in the fields of Fatima, witnessed the apparitions of Mary, now commonly known as Our Lady of Fatima. Pope John Paul II beatified Francisco and Jacinta May 13, 2000, on the 83rd anniversary of the first apparition of Our Lady at Fatima. 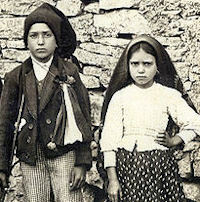 Both under 12 years old, they were the youngest non-martyrs to be beatified in the history of the Church. Historically today is the feast of St. Eucherius, Benedictine bishop of Orleans, France, exiled for opposing Charles Martel, the famous and powerful Mayor of the Palace. Less than two years later, Francisco died of influenza in his family home. He was buried in the parish cemetery and then re-buried in the Fatima basilica in 1952. Jacinta died of influenza in Lisbon, offering her suffering for the conversion of sinners, peace in the world and the Holy Father. She was re-buried in the Fatima basilica in 1951. Their cousin, Lucia dos Santos, became a Carmelite nun and was still living when Jacinta and Francisco were beatified in 2000. Sister Lucia died five years later. The shrine of Our Lady of Fatima is visited by up to 20 million people a year. — Excerpted from Saint of the Day: Lives, Lessons and Feast by Leonard Foley, O.F.M. ; revised by Pat McCloskey, O.F.M. This Saint was born at Orleans, of a very illustrious family. At his birth his parents dedicated him to God, and set him to study when he was but seven years old, resolving to omit nothing that could be done toward cultivating his mind or forming his heart His improvement in virtue kept pace with his progress in learning: he meditated assiduously on the sacred writings, especially on St. Paul's manner of speaking on the world and its enjoyments as mere empty shadows that deceive us and vanish away. These reflections at length sank so deep into his mind that he resolved to quit the world. To put this design in execution, about the year 714 he retired to the abbey of Jumiége in Normandy, where he spent six or seven years in the practice of penitential austerities and obedience. Suavaric, his uncle, Bishop of Orleans, having died, the senate and people, with the clergy of that city, begged permission to elect Eucherius to the vacant see. The Saint entreated his monks to screen him from the dangers that threatened him; but they preferred the public good to their private inclinations, and resigned him for that important charge. He was consecrated with universal applause in 721. Charles Martel, to defray the expenses of his wars and other undertakings, often stripped the churches of their revenues. St. Eucherius reproved these encroachments with so much zeal that, in the year 737, Charles banished him to Cologne. The extraordinary esteem which his virtue procured him in that city moved Charles to order him to be conveyed thence to a strong place in the territory of Liege. Robert, the governor of that country, was so charmed with his virtue that he made him the distributor of his large alms, and allowed him to retire to the monastery of Sarchinium, or St. Tron's. At Rome, the Station is in the church of St. Anastasia, where, formerly, the Mass of the Aurora on Christmas Day was celebrated. The first church was built in the late 3rd or early 4th century, and was one of the first parish churches of ancient Rome. It was given by a woman called Anastasia and called titulus Anastasiae after her. Later, it was dedicated to a martyr of the same name.